Browse the site using it as a guide to decide on any particular golf courses, hotels and transport you wish included in your golf tour. a) Go to “Build My Tour” and send us your requirements. 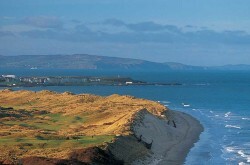 OR b) send us an email outlining your golf tour requirements (e.g. number of golfers/non-golfers, specific golf courses, preferred hotel grade, mode of transport, etc.). OR c) Call our office and speak to one of our Golf Travel Consultants on + 44 (0)1334 478639. We will respond with a personalised itinerary and quotation. This will include, where necessary, any adjustments and suggestions we have to make your tour complete. Once you have decided on your travel dates and are satisfied with your itinerary, we will request a deposit of 40% of your tour cost. The balance of your tour is payable 60 days prior to arrival. Please note payment terms may very for special events such as The Open Championship and St Andrews Golf Week. Many of the golf courses you will wish to play are private golf clubs and therefore have limited tee times and restrictions on visitor play. Often demand outstrips supply, so it is never too early to begin planning your golf tour. With regard to the Old Course in St Andrews, Links Golf St Andrews is one of very few tour operators who have an allocation of tee times. These are strictly allocated on a first come first serve basis. Click Here to view our latest Old Course tee time availability. Those golfers who are not allocated an advanced Old Course tee time will have the option of being entered in the ballot for a tee time. 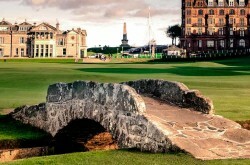 Click Here for more information regarding the St Andrews Old Course Ballot. Most golf clubs allow visitors to use their clubhouse facilities, including the locker rooms and dining areas. Over the last decade, golf clubs have relaxed their dress codes. We would, however, always recommend taking a pair of street shoes (not training shoes) as you may be refused entry to all or part of the clubhouse without them. 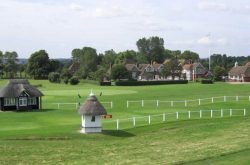 The green fees at some golf courses include lunch and we will advise you of this prior to travel. The majority of the links courses have caddies available because, traditionally, they are walking courses. When requested, we will book caddies and buggies (golf carts) in advance however this does not guarantee availability. Caddies are self-employed and supply can change on a daily basis. Caddy fees inclusive of tip, range from £60 – £80 GBP (approximately). For those golfers who do not wish to have a caddie, the option of pull carts is widely available. Some, but not all, links courses permit limited use of golf carts where age and disability restrictions apply. At the larger golf resorts, golf carts are in greater supply and will be booked in advance on request. It is increasingly common for golfers to ship their clubs in advance and we are happy to take delivery at our office or at the most appropriate location prior to your arrival. We have teamed up with Luggage Forward to provide a service which avoids the hassle of checking and carrying clubs at the airport and eliminates the possibility of airlines losing luggage in transit. 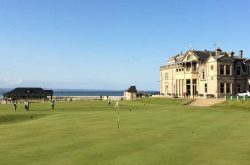 For your upcoming trip with Links Golf St Andrews, have your clubs and other luggage picked up at home and delivered directly to your chosen location, and returned home again upon your departure. With pricing that saves you as much as 50% versus FedEx and UPS, a full money back plus $500 on-time guarantee, and complete customs clearance on your behalf, Luggage Forward is a trusted luggage shipping choice for clients of Links Golf St Andrews. Please click here for more information or to make a booking. Rental sets are readily available and can be reserved in advance for those not wishing to bring their own golf clubs. Notes: Handicap certificates should be carried when playing at all golf courses. Play may be denied for non-production. Not all golf courses require handicap certificates but many do. As a guide, below are a few examples. The weather in this part of the world is better than people have been led to believe. It can, however, be unpredictable. They say this is very much part of the charm of the destination and every golfer should experience the challenging weather at least once during their stay. We’re often asked when the best time of year for golf tours is. Although it is possible to play golf year-round, we view April as the start of the season. This is when we hold the annual St Andrews Golf Week, which attracts golfers from every corner of the world. For the avid golfer who is looking to play 36 holes (or more) in one day, June and July have the longest daylight hours; towards the end of June it is possible to play until 11pm in Scotland! 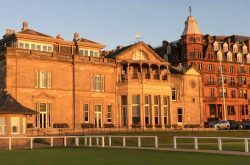 If the Old Course in St Andrews is a must-play, you’ll need to avoid the middle two weeks in September, as the course is closed to visitors for the Royal & Ancient Golf Club’s Autumn Meeting. At the end of October, a number of the Championship courses close and others move to their winter set-up. This is when local golfers take to the links and a 3-hour round is the norm. Whilst on tour it’s most important to experience the best each area has to offer and soak up the local atmosphere. With our expert, up-to-date knowledge, we’ll point you in the right direction for the best dining, pubs, sightseeing and shopping opportunities. For relaxation away from the course there is a tempting range of treatments available. Many of the resort properties, for example, offer wonderfully pampering or rejuvenating spa treatments. Let us know if you or any of your party have a particular interest other than golf (yes, there are other interests!) and we’ll help. As well as sightseeing and shopping destinations, our team will recommend the best visitor attractions, including castles, gardens, and distilleries – there’s so much on offer! Just remembered something while on tour? Need to make urgent contact back home for whatever reason? Our St Andrews office is always happy to assist and offers a range of business facilities. All the vehicles we provide are spacious and have ample room for luggage. For those in self-drive vehicles, we recommend you limit yourself, where possible, to 1 suitcase, golf clubs in a soft case and hand luggage. Over the years there has been an increase in airlines losing luggage in transit. It is therefore advisable to make provision for this i.e. travel with a small carry-on suitcase with essentials, including any medication. Lost luggage should be reported to the airline at the airport where you will be issued with a tracking code/ reference number. In these unfortunate circumstances, it is important that you continue with your travel plans and enjoy your vacation. Therefore our office is always happy to assist in tracing and retrieving your missing items. Links Golf St Andrews strongly recommend that their clients arrange their own individual travel insurance before they travel. Click here for more information.